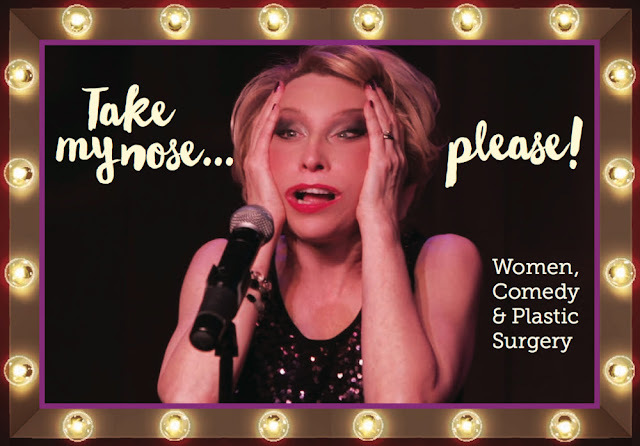 TAKE MY NOSE PLEASE is a seriously funny and wickedly subversive look at the role comedy has played in exposing the pressures on women to be attractive and society’s desire/shame relationship with plastic surgery. More than 15 million cosmetic procedures were performed in the US in 2014. And 90% of them on were done on women. Yet, for those who elect to tinker with Mother Nature, especially for high-profile women, plastic surgery is still a very dark secret. Funny women, though, are the exception. From Phyllis Diller and Joan Rivers to Roseanne Barr and Kathy Griffin, comedians have been unashamed to talk about their perceived flaws, and the steps taken to remedy them. For these dames, cosmetic surgery isn’t vanity, it is affirmative action – compensation for the unfair distribution of youthfulness and beauty. By admitting what their sisters in drama deny, comic performers speak to women who feel the same pressures, giving them permission to pursue change (or not to) while entertaining us. Joan Kron, veteran journalist, spent the past 25 years as contributing editor-at-large at Allure magazine where she covered the hot topics of cosmetic dermatology and plastic surgery. Prior to Allure, she held senior editorial positions at New York Magazine, The New York Times, Wall Street Journal and Avenue Magazine. Kron is known for her books and numerous articles and commentary on design, beauty and plastic surgery. And now at the age of 89 years old, she has embarked on a new career as a documentary filmmaker.